This wonderful mixed media piece was done by aspiring artist, Napoleon high school student, Hailey Altman. 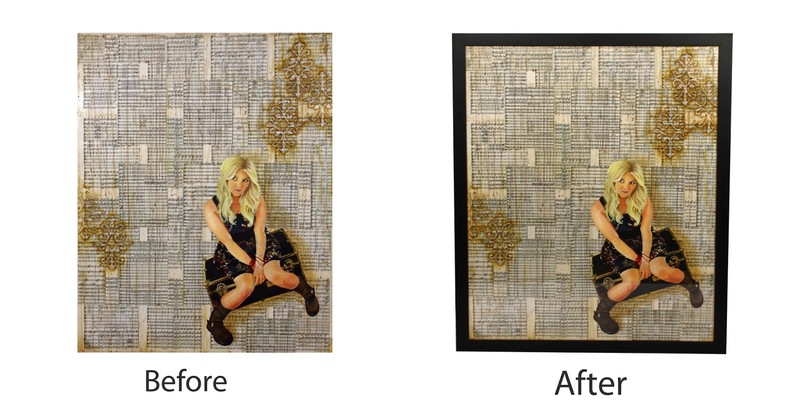 To create this, she collaged coffee-stained music sheets onto a piece of mat board. On top of the music, she used a splatter painting technique to add watercolor and more coffee to the top of the music. Then, she used acrylic paint to create an image of her aunt sitting on a trunk. This piece of work was framed for the Focus Art Show (congrats Hailey!) and will be on display September 8th- October 5th. The framing treatment she chose was a simple one: our Basics wood frame in matte black (8411), standard acrylic, and standard mounting board. The finished size of this piece is 32 x 40 inches. 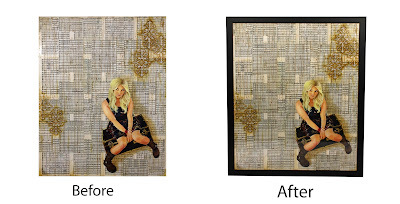 Her choice to frame simply allows the artwork to stand out and take center stage!